Antlions (Myrmeleontidae) are the largest family in the order Neuroptera. There are over 1,200 species within the Myrmeleontidae family. 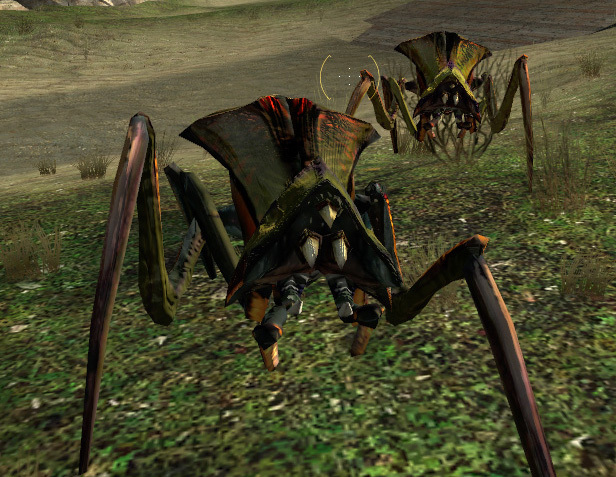 In the video game Half-Life 2 antlions are an important part of the story. Antlions in the game are very different than antlions in reality. These virtual antlions have four legs, two wings and are yellow with green stripes. When people walk on the sand, where the antlions reside, a group of them will crawl out and attempt to surround the trespasser. Real antlions do not act as a group and are independent predators. Most species within the Brachynemurus genus dig conical pits. When an insect falls into these pits, the larva jabs its prey with its piercing mandibles. If the prey tries to escape, the larva will flick sand at it until the prey falls in reach of the larva's mandibles. These pit building antlions will spread out so that they do not interfere with one another. Wondering where I found the information on this website? Visit my References page.